Valedictorian Cambria Weeden receives her diploma and a kiss from her father, WGHS Athletic Director Rod Weeden. 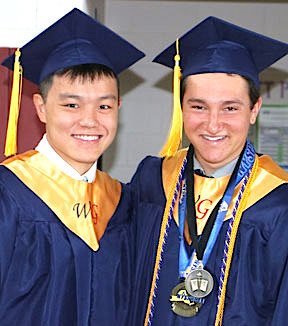 WATKINS GLEN, June 25 -- The Watkins Glen High School Class of 2017 received diplomas Saturday afternoon at the school's 135th annual commencement exercise, held in the school auditorium. The class size of 78 was up three from last year's 75. More than 30 awards and scholarships were presented to graduates. Most of those awards appear below. The Valedictory Address was delivered by Cambria Weeden, who told classmates that "it is not a failure if you change your plans, but it is if you give up what you love." She also said "you shouldn't doubt your value as a person ... Your absence would create a void nobody else could fill ... You are significant." 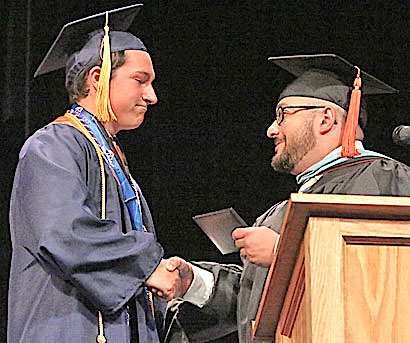 The Salutatory Address was delivered by Jacob Carocci, who told the graduates to "do what makes you happy ... Don't rely on other people to make the major decisions in your life." He also urged "compassion toward other people." 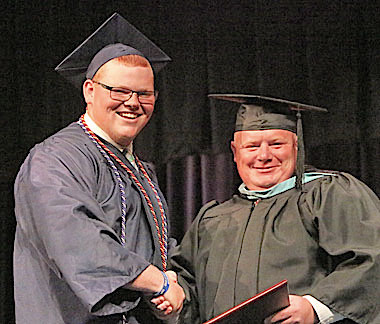 High School Principal Kai D'Alleva said that the class "learned to deal with change, and persevered," and that it proved "resilient ... through triumph and tragedy. You can always come home. We will always be here for you." Class member Alex Gibson, in the Senior Oration, said that the graduates were a tight-knit group, much akin to a family, and that "in light of recent events, the family has been wounded ... Know always that there is a plethora of shoulders to cry on." The "family," he added, "will last a lifetime." 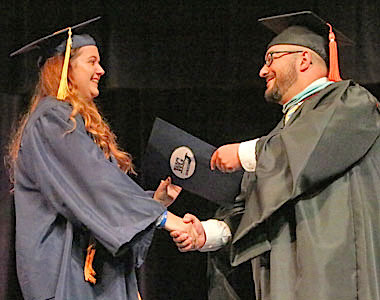 Superintendent Tom Phillips, in his final graduation before retirement, thanked the community for its support that "has affirmed the vision that we must put kids first in all we do." He called the Class of 2017 "historic" for its athletic achievements, which included two team state titles and one individual state title. He said the class was "focused and competitive, and dedicated to one another." Top: Amanda Pike receives her diploma from School Board member Keith Caslin. Second: Alex Gibson delivers the Senior Oration. 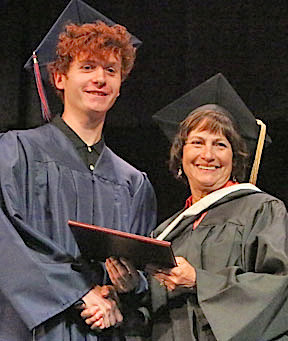 Photos on right: From top: An award is presented to Ruthe Gardner by High School Principal Kai D'Alleva; diplomas are presented by Superintendent Tom Phillips to Will Fitzsimmons and Shawn Rutledge. Katherine Taylor receives an award from Senior Class Advisor Sam Brubaker. The awards presented at Saturday's graduation ceremony included the following. $500.00 given to a Senior who has shown significant academic improvement in his or her high school career. $450 given to two seniors who have earned an average of at least 85% and who demonstrate exemplary leadership, service, and stewardship to school and community. $1,000 given to one senior after completion of the first semester of college based on citizenship, dependability, academic achievement and entering the education field. $250.00 awarded to three graduating seniors who have played for the CVSA Soccer League. $1,000.00 and a plaque given to a Senior for outstanding scholastic achievement awarded after the 1st semester of college. $1,000.00 and a plaque given to a senior after successful completion of the first semester of college, for academic improvement of the four years. $1,007.00 given to a senior who has displayed a desire to live a purposeful, fulfilling life that demonstrates the life lessons Devon bestowed upon us. This senior exemplifies good character and citizenship, keeping a sense of humor along the way, also displaying the importance of family, friends, and community in his daily living, being involved in groups that may include but are not limited to:sports, music, church, scouts, etc. $500.00 per year given to four seniors, awarding academic excellence. 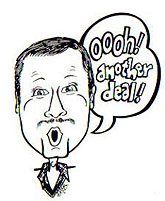 $1,000 given to a Senior who has a passion for the automotive trade. This scholarship is given in memory of Frank Anthony DeSarno, a Watkins Glen High School graduate. $200 given to a senior who has high academic achievement in Math. From the top: Jacob Carocci receives the Salutatorian Award from High School Principal Kai D'Alleva; teachers (from left) Chris Clark, Zach Brown and Ben Connelly on their way to graduation; Serafina Lopresti sings the National Anthem; graduate Cameron Connelly is congratulated by his sister and mother; graduate Patrick Hazlitt poses with (from left) sister Sarah, mom Cheryl, dad Doug and sister Shannon; Chase Richtmyer receives his diploma from School Board member Keith Caslin; Connor Seeley-Ion receives his diploma from Superintendent Tom Phillips. Senior Class Advisor Sam Brubaker introduces the graduating Class of 2017 before diplomas were bestowed. Diplomas presented by Superintendent Phillips to: Tiffini Crissinger and Dakota Cole. Left: Exchange student Moeko Oshima and High School Principal Kai D'Alleva. Right: Graduates Dakota Evans (left) and Liz Mason. Receiving their WGHS diplomas: Max Schimizzi and Joelle Slater. Left: Courtney Irwin receives an award. Right: Aidan DeBolt during the processional. Diplomas presented by Superintendent Phillips to: Casey Falls and Alexis Atchie. 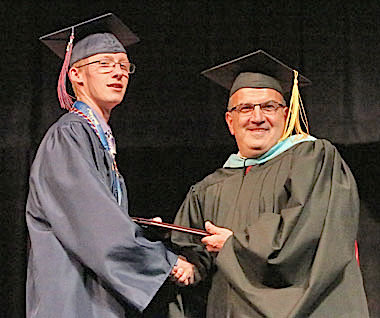 Left: Dominick Rolston receives his diploma. Right: Rong Hang Lin and Jacob Carocci.